drones has been under-addressed, it seems, with all the (understandable) emphasis on Ebola, terrorism in Paris, in Syria, and so many other places, air crashes and the myriad other tragedies occurring all over the world. But, drones still remain as an issue of vital importance to us all as they wreak their havoc in remote corners of the globe without regard to their so-called collateral damage (otherwise known as the killing of innocent human beings). Harlem district office. The alarming loss of innocent civilians in the process is of great concern, and the group hoped to enlist Congressman Rangel's support in their efforts to have drones regulated. 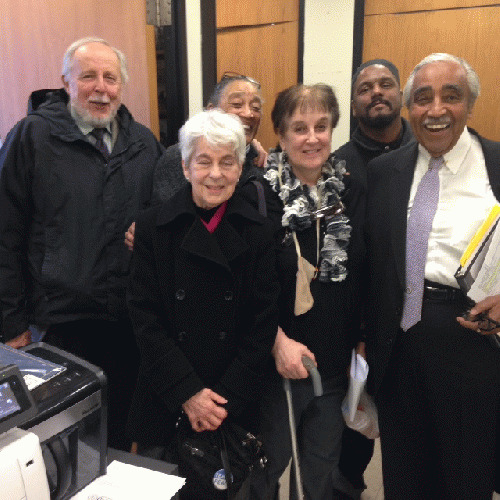 The anti-drone activists were very encouraged by Mr. Rangel's response. He made it clear that he, too, is very opposed to the use of the drones as weapons of destruction. "It is wrong to target people we don't know in countries we don't know for reasons we don't know." Mr. Rangel stated. He promised to participate fully in our rallies and protests regarding drones and said he would be there for us in this urgent struggle. If only there were others in Congress with Mr. Rangel's conviction and courage to speak out against these instruments of death launched so cavalierly around the world.